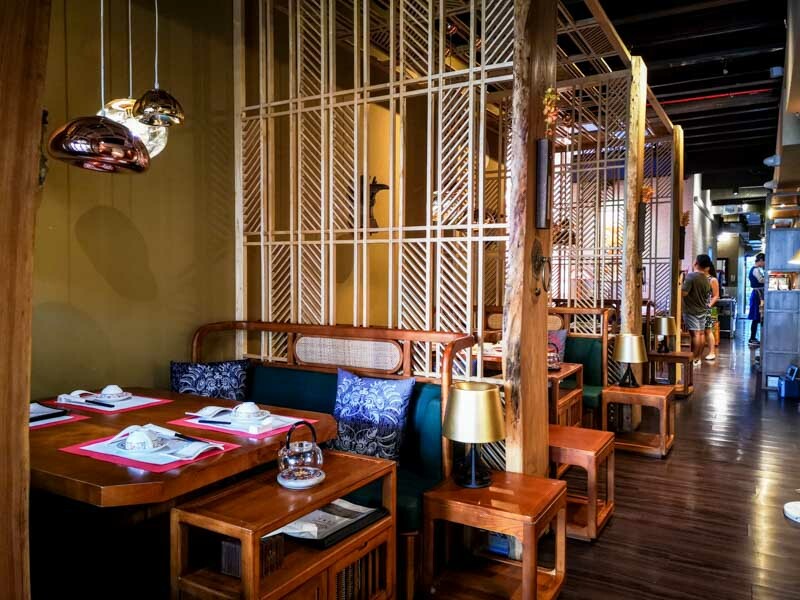 Ganglamedo has got to be one of the most novel and refreshing additions to our F&B scene of late. Its cuisine focuses on vegetarian dishes using almost-unheard-of ingredients to the common palate. 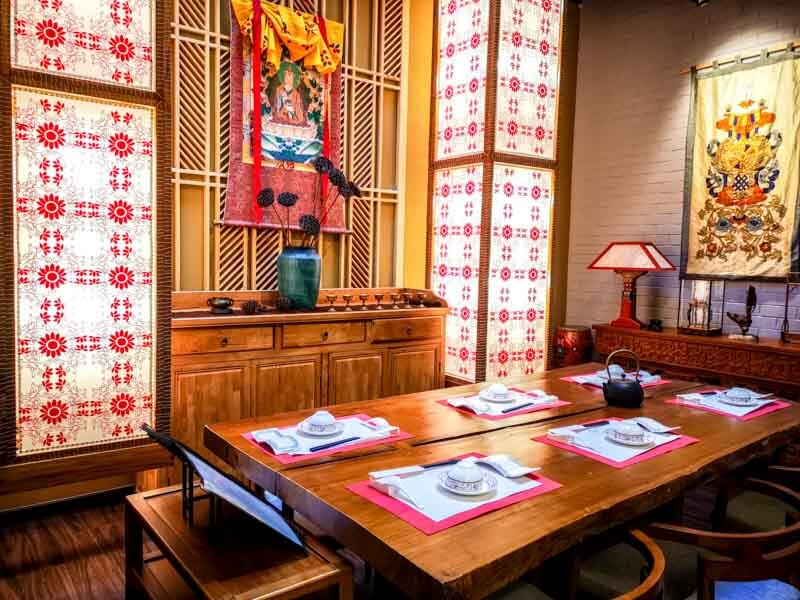 Located along Craig Road, its representation of Tibetan culture extends beyond its menu, with its substantial feature of large wooden furniture, right down to its intricate crockery. 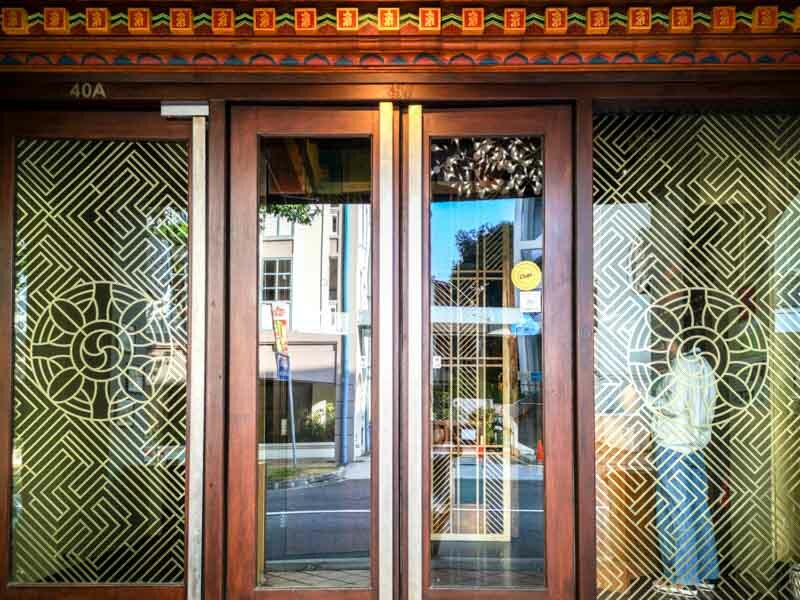 Their menu highlights numerous multi-course menus, with only a limited a la carte selection. With that consideration, we went for the five-course dinner menu (S$59.90++ per person). We kicked off the meal with Bread (S$8 for four pieces) unlike any other. 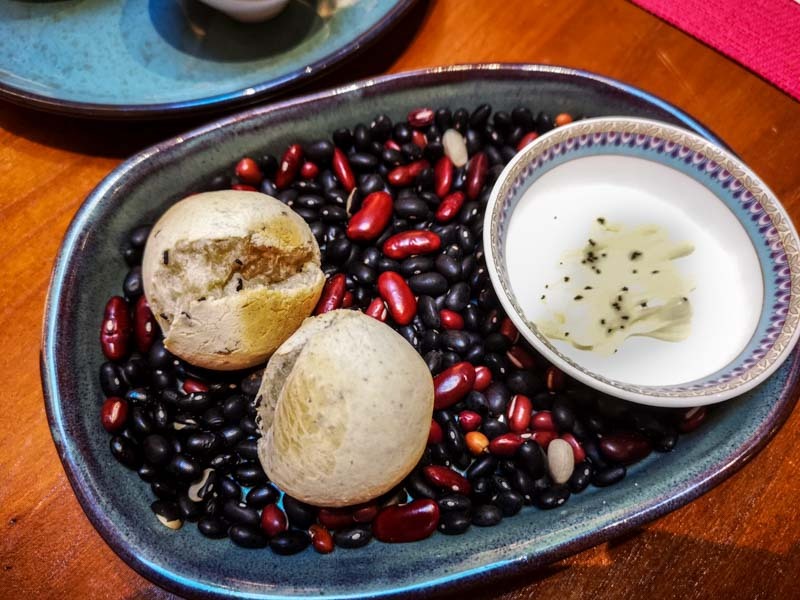 The bread is a sesame mochi bread served with homemade mayonnaise. The texture was heavenly; a symphony of chewy, soft and slightly crusty all in one. Australian small pearl rice is used in the bread mix, while Tibetan tea powder is incorporated into the homemade mayonnaise, making it subtly smoky and more savoury than regular mayonnaise. It was extremely, addictively good that we shamelessly asked for a second portion. 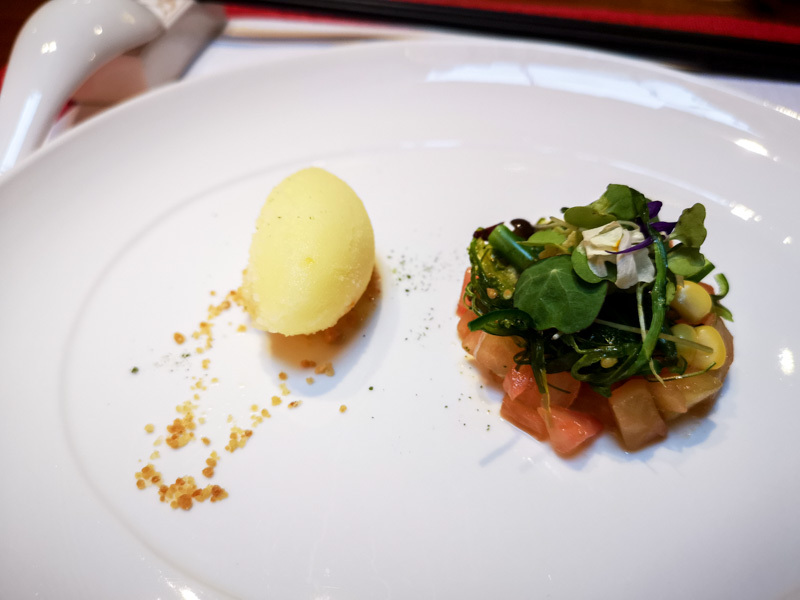 The Ganglamedo Garden Salad kicked off the five-course menu, complemented by lime and pomelo dressing and yuzu sorbet. The salad comprised of tomatoes, asparagus, sweet corn, beansprout flowers and wakame (a type of edible seaweed). Although it didn’t do much to excite me personally, I absolutely loved the yuzu sorbet. The weather was rather unforgiving that day, and this was exactly what my heaty body needed. 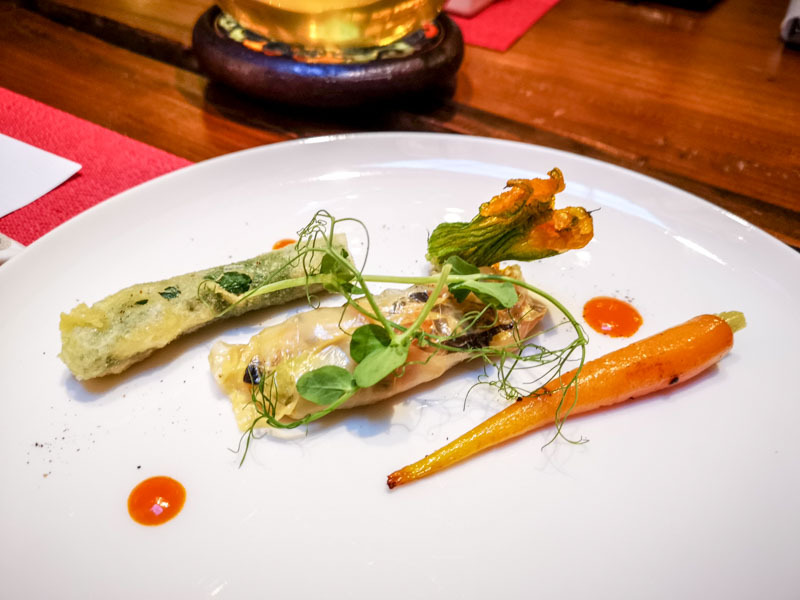 The next course came with a Bean Curd And Rice Roll Wrap, with bell pepper sauce and zucchini flower tempura. I do love a really well done zucchini flower tempura, and this one didn’t disappoint. 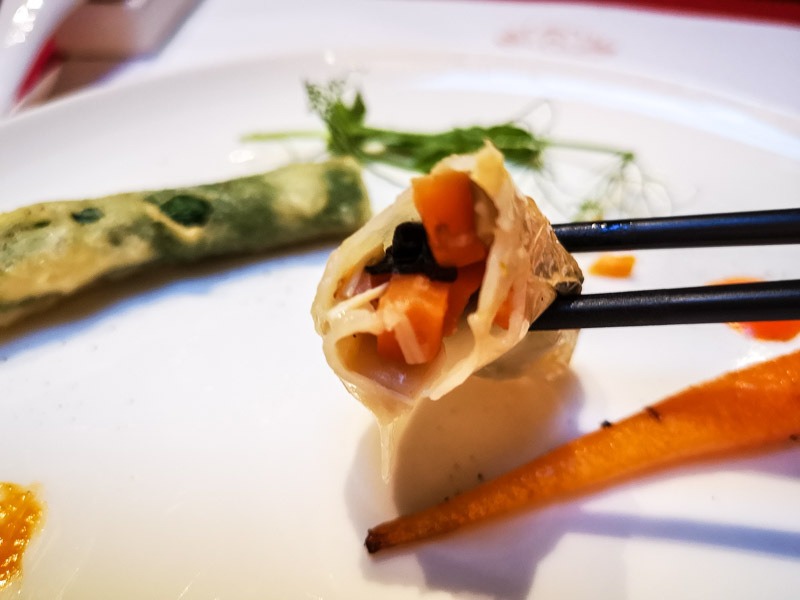 The rice roll wrap had a modest serving of carrots and black fungus mushrooms, making it a full-bodied yet light-enough bite to set my hunger up for the dishes to come. 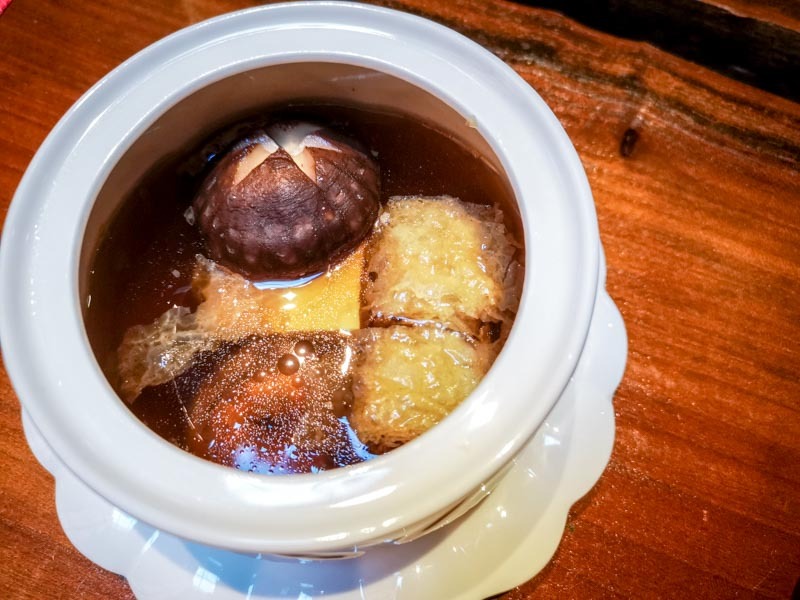 The Soup Of The Day was a mushroom-centric recipe that uses 12 types of mushrooms that has been boiled for three to four hours, resulting in an earthy, woody and hearty soup. There’s also beancurd skin and bamboo funghi, so there’s plenty of textural satisfaction in this comforting dish. 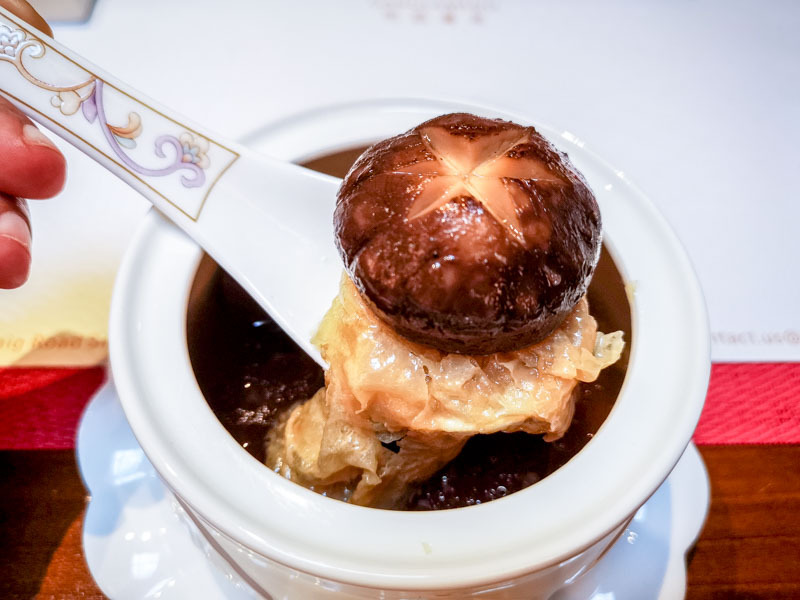 The main course segment of the menu has an option of either Tibetan Noodle With Porcini Mushrooms or Truffle Steam Rice. The former dish was really appetising, even without the use of onions and garlic. In fact, Ganglamedo doesn’t even cook with or serve alcohol, so it’s actually Muslim-friendly! I was amazed by how rich this dish was. 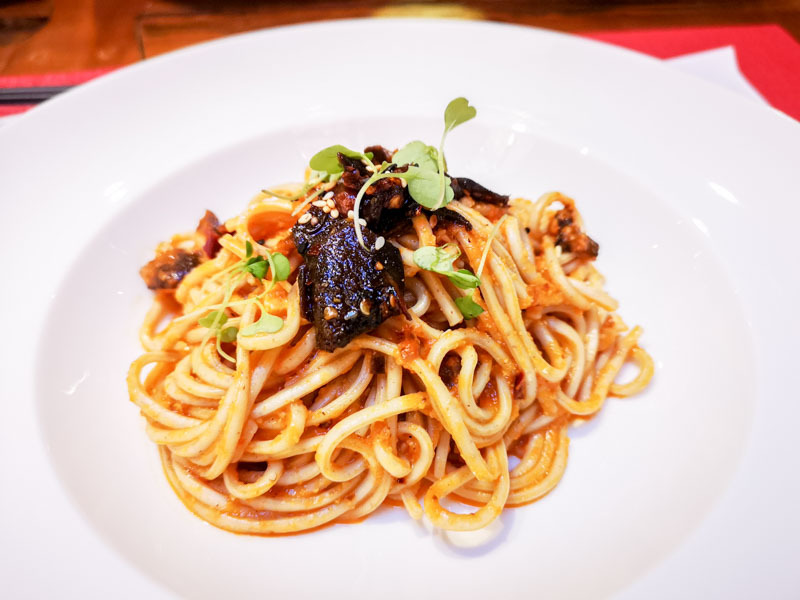 Using Tibetan wheat noodles, it was chewy, with substantial bite, and the mushrooms were doused in mala paste. That really elevated this scrumptious dish, and made it highly addictive! 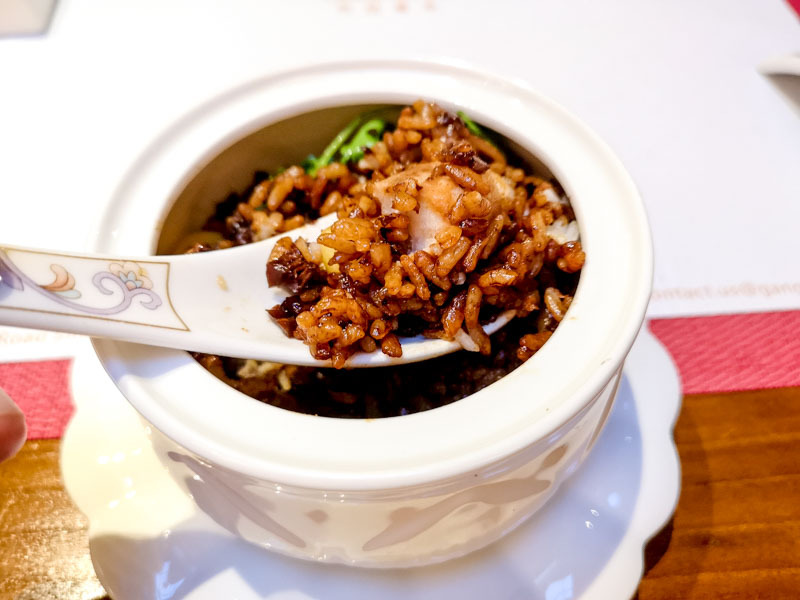 The rice dish held a bounty of ingredients like chestnut, yam, mushrooms, gingko nuts — chosen to represent the five elements of nature, we were told. My only wish was that the edges were burnt to a crisp, much like rice at the bottom of the claypot, but I suppose that wasn’t the intention of the dish. Overall, it wasn’t overly impressive, but it definitely helped to fill me up, given the absence of meat from the entire meal. Tea lovers would positively love this palate cleanser. 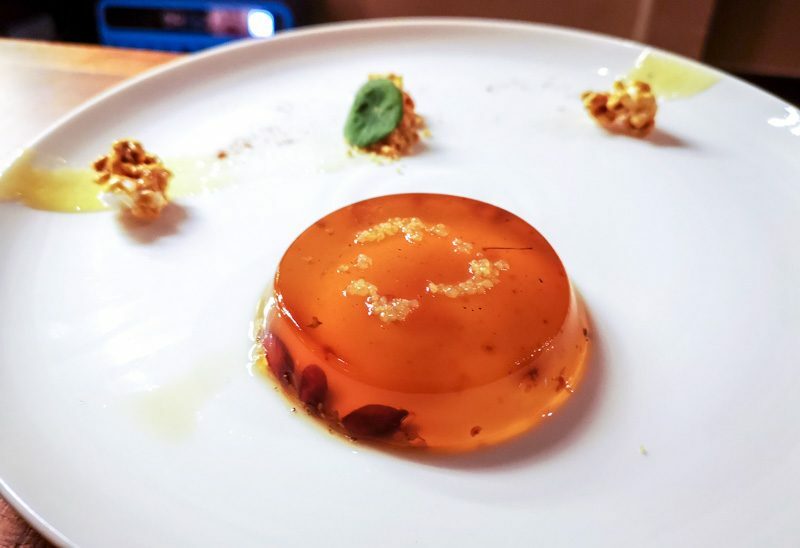 The Osthmanthus Jelly With Tibetan Tea Crumble was a sight to behold. It was peppered with tea crumbles and honey popcorn, it was only mildly sweet. I suppose enjoying this dessert was much like eating your tea as opposed to drinking it, which was novel and also enjoyable. Getting to experience Tibetan cuisine in itself was really an eye-opening meal experience. What more when that it was a purely vegetarian meal. The flavours were surprisingly potent, despite being of non-meat origin and everything was prepared sans garlic, onions and alcohol. 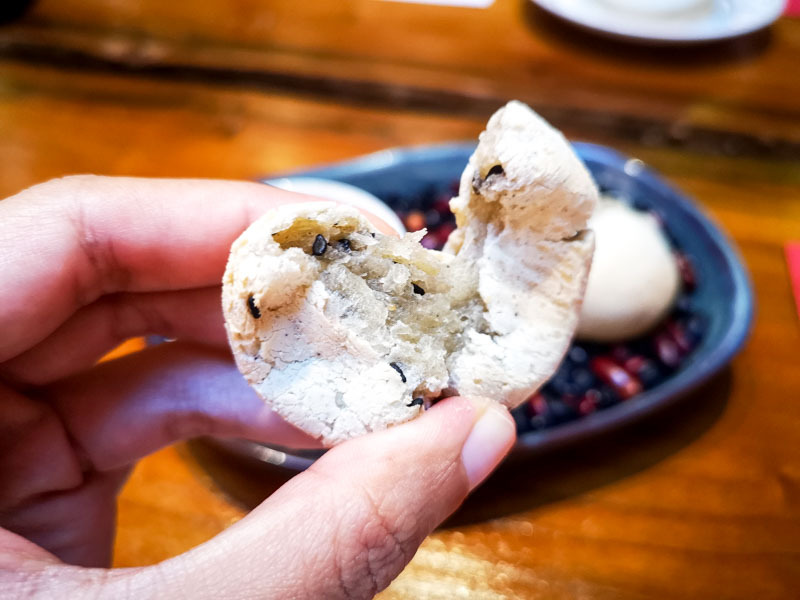 I recommend not dismissing the opportunity to give have a vegetarian meal at Ganglamedo the next time around, because you never know the wonders that you may discover — just like I did.